Typing Pool with a Blind Typewriter! 149 words a minute on IBM electric. See story here. 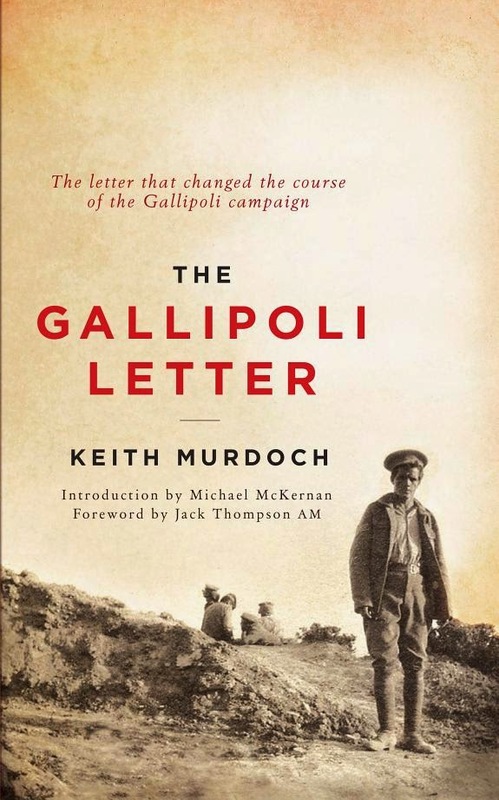 On Thursday, September 23, 1915, less than five months after the start of the Gallipoli campaign, in which Australia and New Zealand fruitlessly sacrificed 10,862 of its young men on a Turkish beach, 30-year-old Australian war correspondent Keith Murdoch sat down at his Corona 3 portable typewriter in the office of Sir George Reid, the Australian High Commissioner, at Victoria House on The Strand in London, and typed a 8000-word letter on 25 pages. 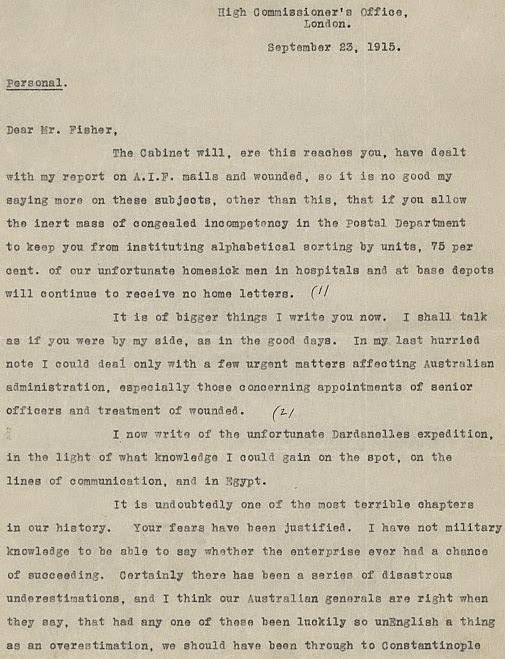 Murdoch's letter, addressed to family friend, Australian Prime Minster Andrew Fisher, was to change the course of not just the disastrous Gallipoli campaign but of Australian and New Zealand history. 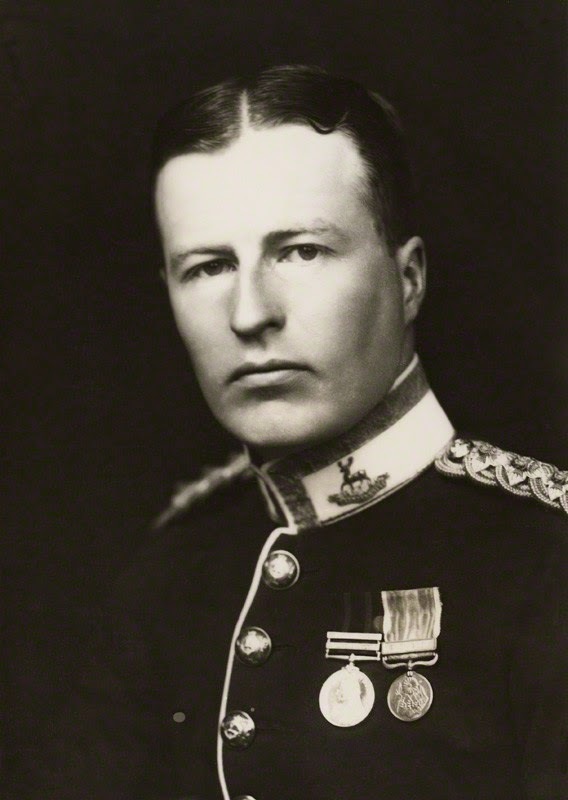 By ultimately exposing extreme British military ineptitude, and the all-too-eager willingness of British politicians (most notably Winston Churchill) and generals (most notably subsequent Hitler admirer Ian Hamilton) to waste so many thousands of young colonial lives on a futile mission, it changed the attitudes of Australians and New Zealanders toward the "ruling classes" of "Mother England" forever. The apron strings began to wear thin and snap: it was the beginning of the end of our forelock tugging to our "masters", our "superiors" in the so-called "homeland". 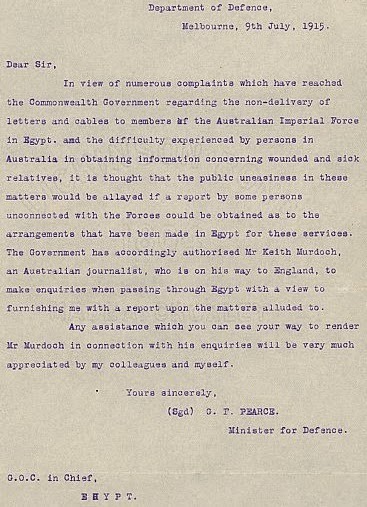 In July 1915, Fisher and Defence Minister George Pearce had sent Murdoch to Gallipoli, ostensibly to check on how well the soldiers' mail was being distributed; but his clandestine mission was to check on how the campaign and the Australian troops were faring. Words Hamilton would soon come to deeply regret. 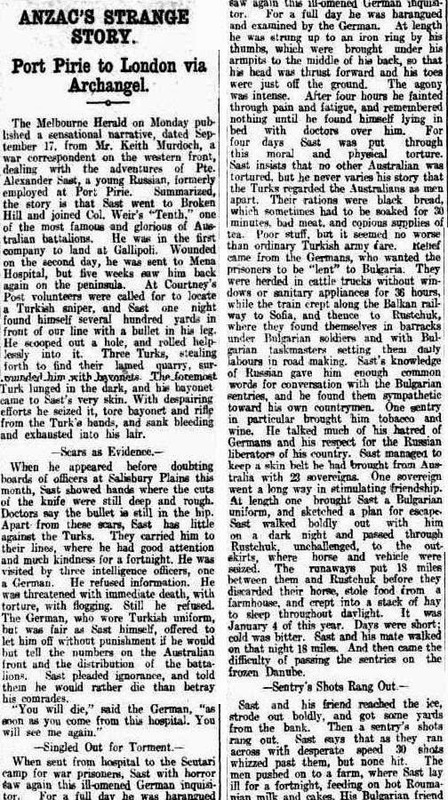 At Gallipoli in early September 1915, Murdoch was befriended by the London Daily Telegraph correspondent Ellis Ashmead-Bartlett, who was deeply concerned that censorship was being used to suppress criticism of the Dardanelles campaign. See Ashmead-Bartlett's own description of his meeting with Murdoch and Murdoch's subsequent request to him here. after the censors had been at it. 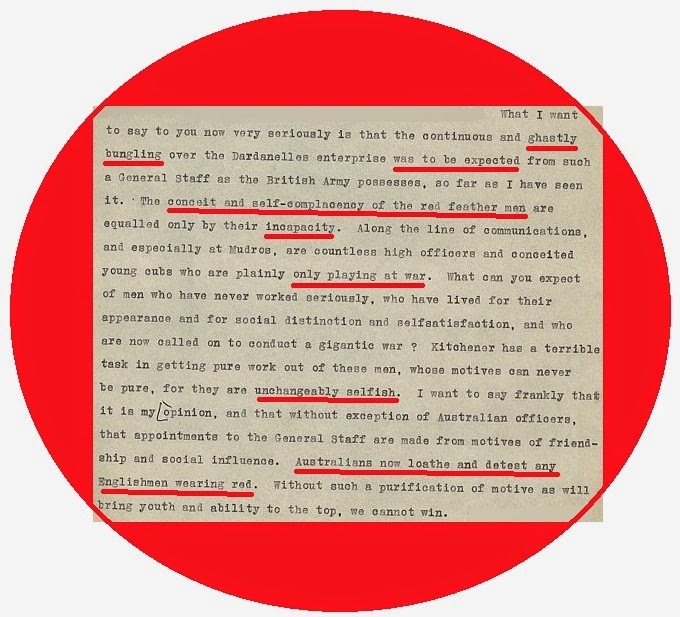 Murdoch "begged" Ashmead-Bartlett to write an uncensored letter which Murdoch would carry back to London and give to British Prime Minister Herbert Asquith. The letter (see its full contents here, also British military reaction here) was written on September 8 and a week later Murdoch left for London. 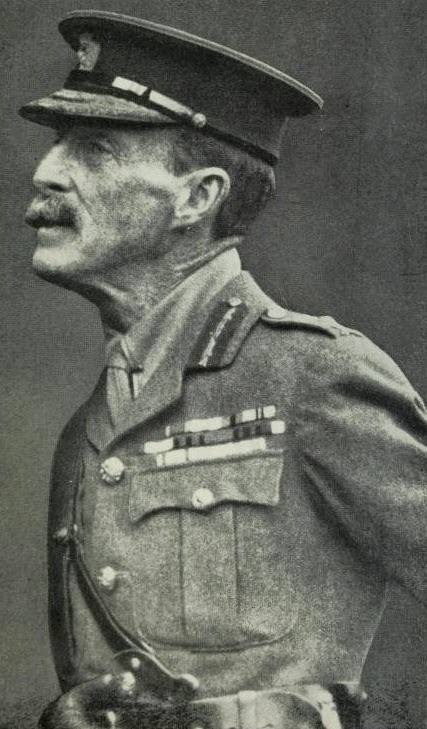 Demented British general Ian Standish Monteith Hamilton, a madman deciding the fate of so many young Antipodeans. In a classic understatement, Asquith said he had "too much feather in his brain". Hamilton was tipped off about Ashmead-Bartlett's letter by an official Royal Navy war photographer, sent word ahead, and Murdoch was arrested by British military police in Marseilles and the letter was confiscated. 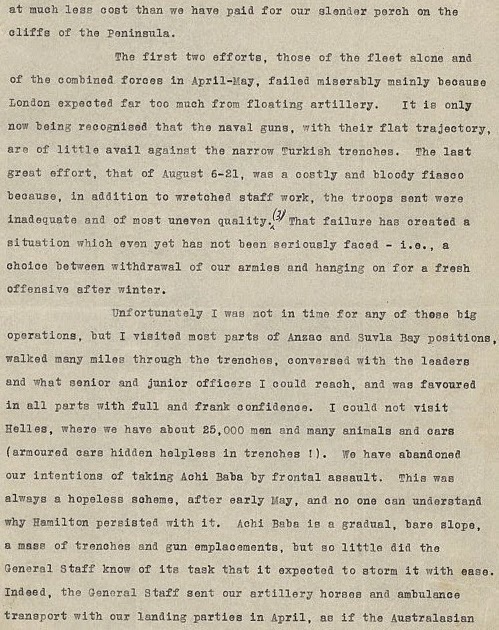 Arriving in London on September 21, Murdoch then typed his own letter, in a similar vein to the Ashmead-Bartlett letter. 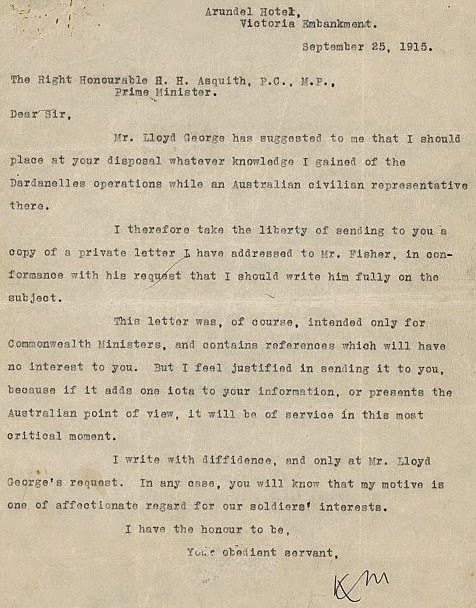 After sending the letter to Australia, he supplied two copies to the British Munitions Minister David Lloyd George. 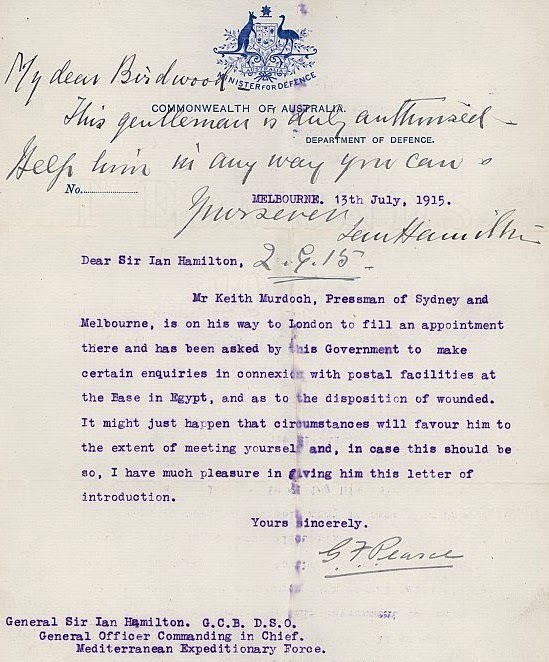 Murdoch also sent his letter to Asquith, and it was subsequently printed as a secret state paper and circulated to senior ministers of the British government. 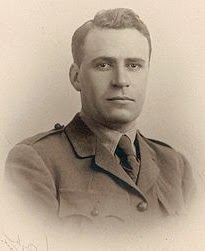 Ashmead-Bartlett was expelled from the Dardanelles on September 28, reached London, and his version of events began to be published. 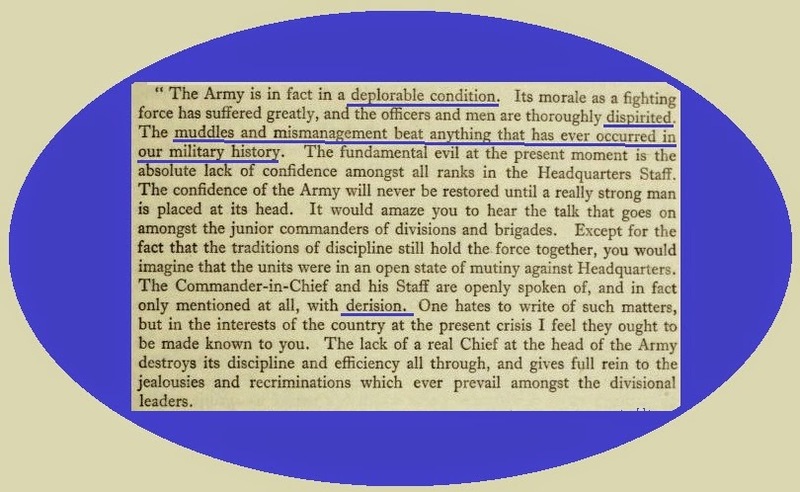 Hamilton was relieved of command on October 16. 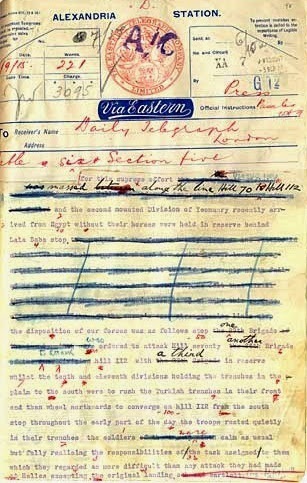 The subsequent operation to evacuate the troops from Gallipoli was completed with perfect effectiveness by December 20. Young Australians lie dead in the trenches of Gallipoli, 1915. When, on Anzac Day last Friday - the 99th anniversary of the bloody landing on Gallipoli on April 25, 1915 - Australians and New Zealanders talked in terms of being "born of Anzac", "where it all started", of Gallipoli "at the core of our sense of nationhood", a "symbol of freedom, our national pride", they were not talking about helping one lot of Germans (from the House of Saxe-Coburg and Gotha) fight another lot of Germans (and Turks). No, they were talking about the day we first sensed an end to our unquestioning loyalty, our unwavering allegiance to Britain. And we have Keith Murdoch to thank for first expressing that new-found sense of ourselves. Keith Murdoch outside Charles Bean's dugout at Gallipoli, September 3, 1915. There's a Corona 3 in that box. 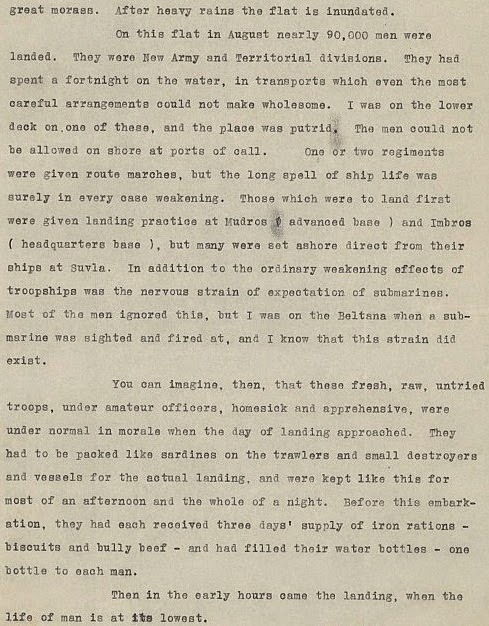 Here are the first four pages of Murdoch's now famous "Gallipoli Letter", a document which could arguably come to be almost as significant to Australians and New Zealanders as the Declaration of Independence is to Americans. Apart from the Maori (New Zealand had its own Declaration of Independence in 1835), we did not fight the British. But after the contents of Murdoch's letter became widely known, we no longer trusted Britain to the resolute extent we once had, and we no longer believed we owed Britain anything. The full letter can be read here (pages 1-20) and here (21-25). 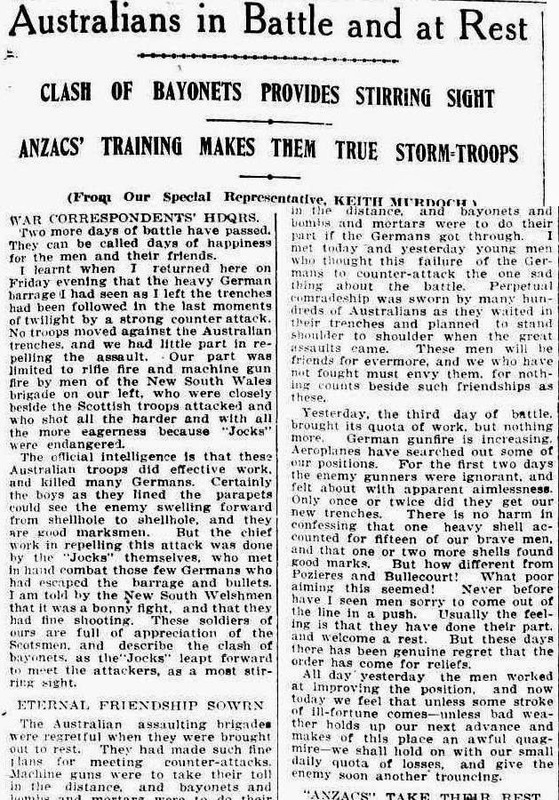 The day after his arrest, at the height of the WikiLeaks affair in early December 2010, Julian Assange wrote an opinion piece in Australia's national daily newspaper, The Australian (owned by Keith Murdoch's son Rupert Murdoch), that "Keith Murdoch's expose that Australian troops were being needlessly sacrificed by incompetent British commanders on the shores of Gallipoli led to the termination of the disastrous campaign. WikiLeaks is also fearlessly publishing facts that need to be made public." 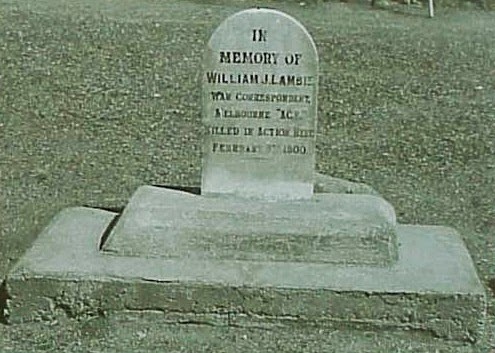 Australian journalist Phillip Knightley said in his book The First Casualty that Murdoch's letter was ''a mixture of error, fact, exaggeration, prejudice, and the most sentimental patriotism, which made highly damaging charges against the British general staff and [General Ian] Hamilton, many of them untrue''. This fails utterly to see the point here. 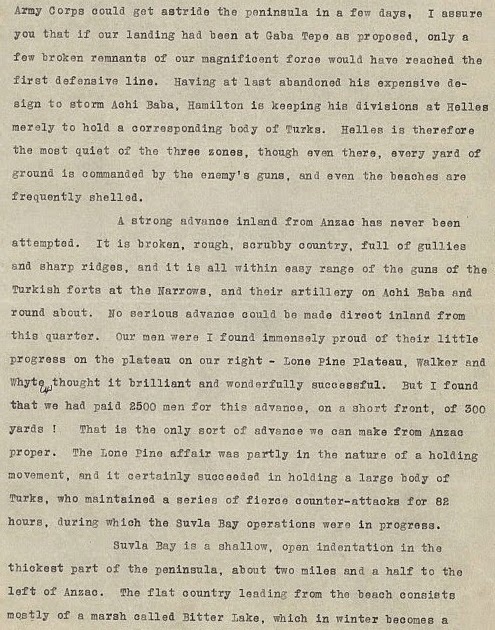 Regardless of whether it came from Murdoch or Murdoch's recollections of Ashmead-Bartlett's letter (Murdoch had a "phenomenal memory"), the bottom line is that the Gallipoli Letter opened the eyes and minds of people in Britain and Australia as to what was actually happening in Gallipoli, the truth about the pointless carnage there. That is what is important here, not what Knightley might think about the accuracy or otherwise of the details. The letter changed things for the better, as Knightley's own journalism was able to do. Australian war correspondents Gordon Lancy Gilmour, Charles Bean and Keith Murdoch watch the 57th and 58th Battalions in action against Cabaret Wood Farm, a position in the Hindenburg Line, about 1200 yards north-east of Bellicourt in France, in September 1918. Murdoch has a telescope perched on his Corona 3 case. Murdoch, centre, with Australian war correspondent Herbert Campbell-Jones and Queensland editor John James Knight near Peronne during a September 1918 visit to the Australian front at Picardie on the Somme. 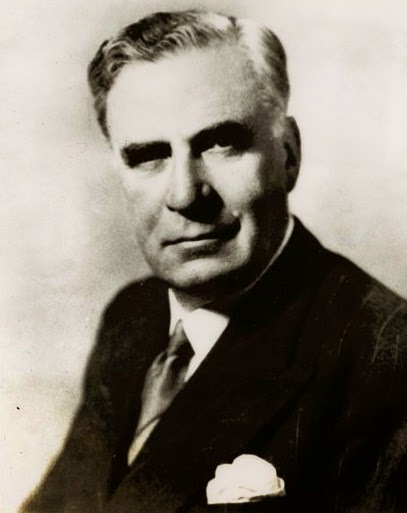 Keith Arthur Murdoch was born in West Melbourne on August 12, 1885. In 1904 his Presbyterian father introduced Murdoch to his Presbyterian friend, Melbourne Age publisher and editor David Syme, who, impressed by the boy's shorthand skill, employed him at 1½ pence a line as district correspondent for Malvern, a middle-class suburb unsympathetic to the Age. For four years, working very long hours, Murdoch was highly successful in working up local news and increasing circulation in the area, and graduated to staff reporting assignments. He had saved £500 when in April 1908 he sailed steerage for London. 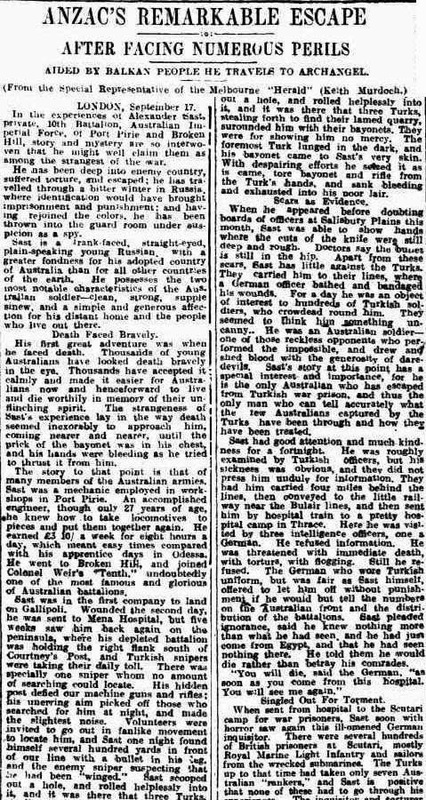 By 1911, back with the Age, he became Commonwealth parliamentary reporter. He was a founding member of the Australian Journalists' Association, which was established in 1910. 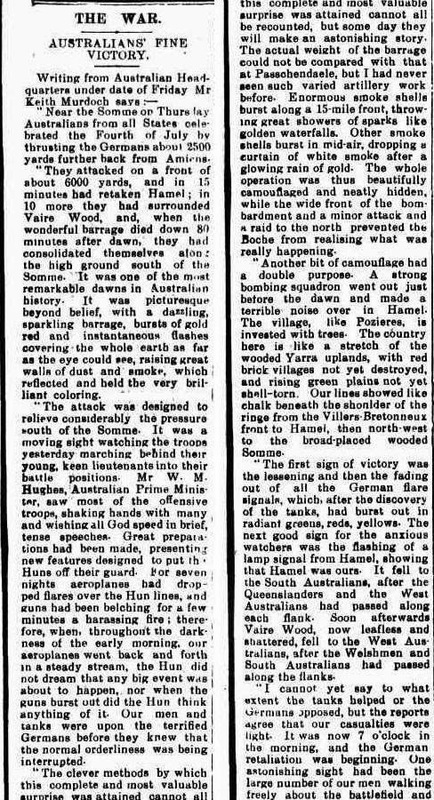 In 1912 (when Federal Parliament was still in Melbourne), Murdoch was given the job of Melbourne political correspondent for the Sydney Sun. Murdoch with Australian Prime Minister Billy Hughes on the Somme in July 1918. 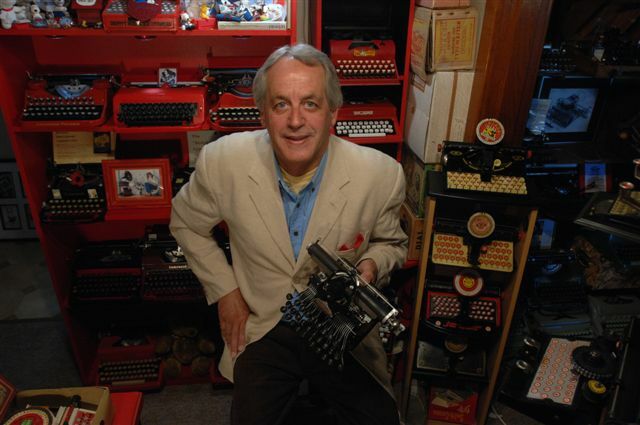 Both were Corona 3 users, and Murdoch did a lot of press and other work for Hughes during his visit to Europe. When World War I broke out, Murdoch narrowly lost an Australian journalist's ballot to Charles Bean for the coveted position of official correspondent to the Australian Imperial Force (AIF). In 1915 he was transferred to London to take up the position of managing editor of the United Cable Service, set up for the Sun and Melbourne Herald. At the Paris Peace Conference, he was the only Australian journalist to witness the signing of the treaty. Campbell-Jones, Knight and Murdoch in the forward area near La Maicourt, between Flamicourt and Peronne, with the 5th Battalion Pioneers, September 1918. After the war, Murdoch rose to high positions in the newspaper world and in 1921 became chief editor of the Melbourne evening the Herald. He was knighted in 1933, retired in 1949 and died, aged 67, in his sleep at Cruden Farm (Langwarrin, Victoria) on the night of October 4-5, 1952, having undergone several operations for cancer in the preceding years. Stylised print of Keith Murdoch's account of the Australian attack on Bullecourt which features the cropped studio portrait of 975 Private William James Patrick Quinn, 20th Battalion, of Singleton, NSW. Scottish-born William John Lambie (1860-1900), the first Australian war correspondent to die in the course of carrying out his duties. Lambie was killed outside Jasfontein in the Northern Cape Province and is buried at Colesberg, Pixley ka Seme District. We started this series with the announcement of plans to have a memorial here in Canberra for Australian war correspondents. Just such a memorial for Boer War casualties was unveiled in St Paul's Cathedral, London, England, in March 1905, and one of the correspondents thus honoured was an Australian, William John Lambie. The memorial was unveiled by Field Marshal Frederick Sleigh Roberts, 1st Earl Roberts VC, who led British Forces to success in the Second Boer War. *Horace Harry (Jack) Spooner died in May 1900, three months after Lambie. William John Lambie was born on March 28, 1860, in Southend, Argyll, Scotland, the son of the Reverend James Lambie and his wife Agnes Colquhoun Jaffray. He arrived with his family in Australia from London on the Winefred on April 7, 1863. 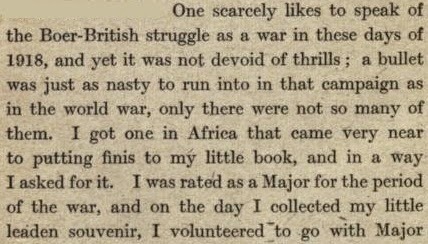 William Lambie first saw duty as a war correspondent in the Sudan in 1885, when he was accredited for The Sydney Morning Herald. Accreditation allowed war correspondents to "draw food and fodder rations [and] tacit permission to use the military’s telegraph for censored dispatches and entitled them to campaign medals.” However, an outstanding act of bravery by Lambie did not earn him a medal, as the British War Office refused to recognise the services of non-combatants. Lambie had distinguished himself by riding through enemy lines with despatches. When Arab armies laid siege to the city of Khartoum and its British defenders, the general staff ordered a relief expedition. 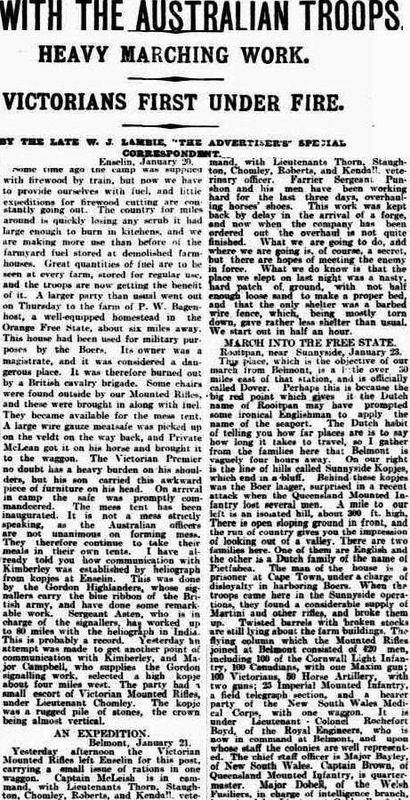 Frank Le Poer Power of The Times of London and Lambie volunteered to accompany this operation. As it sailed down the Nile bound for Khartoum, Sudanese fighters ambushed the flotilla; in the bitter fighting that followed, Lambie was wounded and Power murdered. 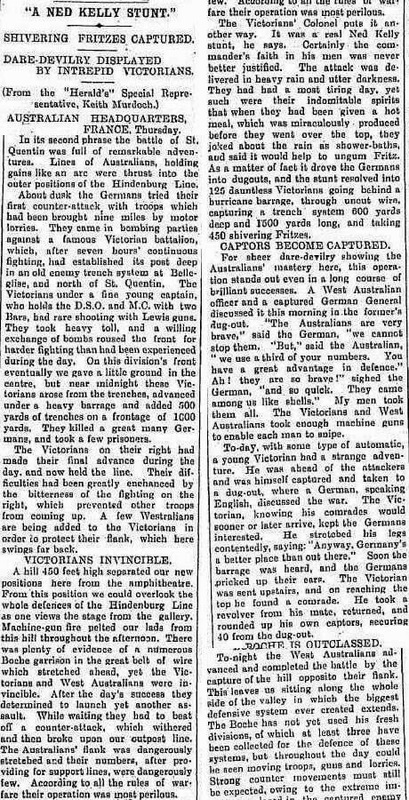 Another, more contemporary version of events, was that in May 1885 "Two newspaper correspondents while returning here were surprised by a few of the rebels. Both had to spur hard for Suakin [or Sawakin, a port in north-eastern Sudan, on the west coast of the Red Sea] closely pursued by their assailants. They happily succeeded in shooting down two or three of the rebels, upon which the remainder desisted. Mr Lambie, one of the gentlemen so surprised, sustained, however, a severe wound in the leg." 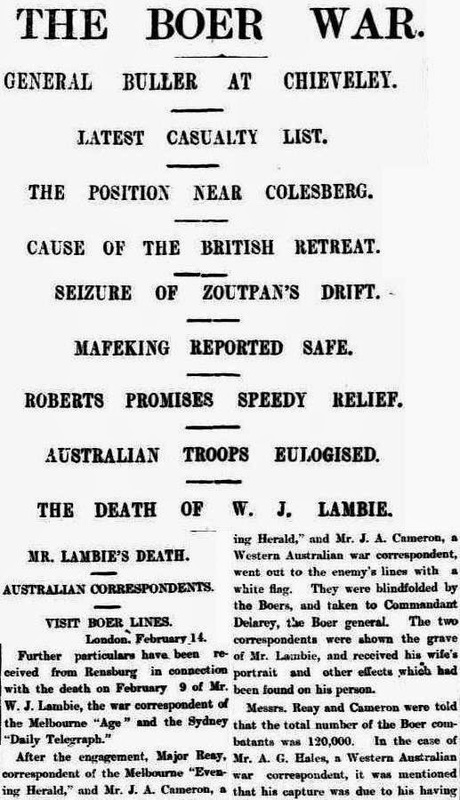 The Glasgow Herald added: "Whilst Mr Lambie, the correspondent of The Sydney Morning Herald, was riding back to Suakin ahead of the column he was suddenly shot through the leg." In September 1888, Lambie was in Samoa when Mata'afa Iosefo (1832-1912) commanded followers in a rebellion against the German-backed Tamasese, who was proclaimed Tafa'ifa, or King of Samoa. In the battle Mata'afa's warriors send Tamasese's forces retreating to Mulinu'u Point, where a German gunship offered protection. After an ensuing bombardment of his villages, Mata'afa retaliated by wiping out an invading German contingent and plundering the German plantations at the First Battle of Vailele. Eventually Germany, the United States and Britain agreed that Malietoa Laupepa would be restored as the Tafa'ifa of Samoa. 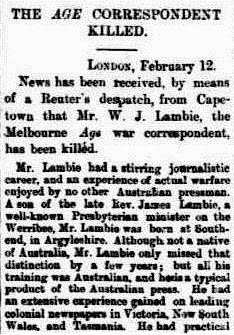 Announcing Lambie was returning to war correspondence duties in South Africa, on December 21, 1899 the Freemans Journal reported: "Mr W.J.Lambie, who is representing the leading Australian Liberal daily the Melbourne Age at the seat of war, can make a boast that no other living war correspondent can utter. He is the only pressman who has seen Germany defeated since the Franco-Prussian War [1870-71]. He was an eye witness of the annihilation of a German force by Mata'afa and his warriors in Samoa." 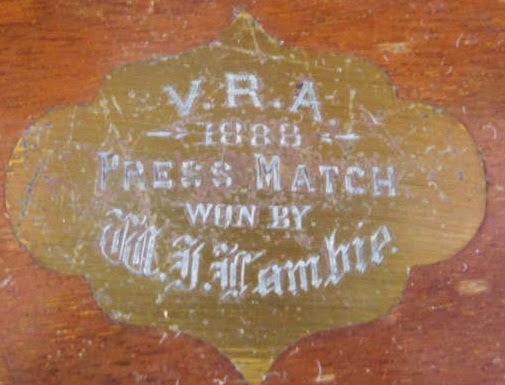 The same year he was in Samoa, 1888, Lambie won the Victorian Rifle Association "Press Match" competition at Williamstown rifle range. 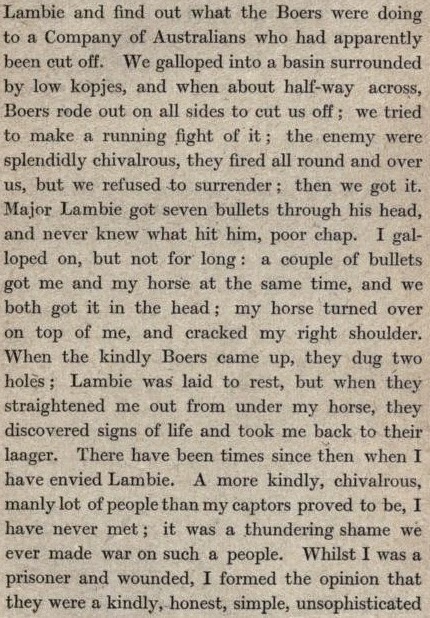 "Lambie's big chestnut mare had gained a length on my little veldt pony, and we were not more than a hundred yards away from the Mauser rifles that had closed in on us from the kopjes. A voice called out in good English: 'Throw up your hands, you damned fools'. But the galloping fever was on us both, and we only crouched lower on our horses' backs, and rode all the harder, for even a barnyard fowl loves liberty. All at once I saw my comrade throw his hands up with a spasmodic gesture. He rose in his stirrups, and fairly bounded out of his saddle, and as he spun round in the air I saw the red blood on the white face, and I knew that death had come to him sudden and sharp." When told that Lambie and Hales were war correspondents, the Boer leader told Hales, "Sir, you dress exactly like two British officers; you ride out with a fighting party, you try to ride off at a gallop under the very muzzles of our rifles when we tell you to surrender. You can blame no one but yourselves for this day's work." The next day 1st Tasmanian (Mounted Infantry) Contingent lieutenant Francis Bede Heritage (1877-1934; from 1922-29 commandant at Royal Duntroon Military College in Canberra) carried a white flag and approached the Boers seeking information about the missing journalists. General Jacobus Herculaas (Koos) de la Rey (1847-1914) gave Heritage Lambie's watch and other small items, including a photo of his wife. 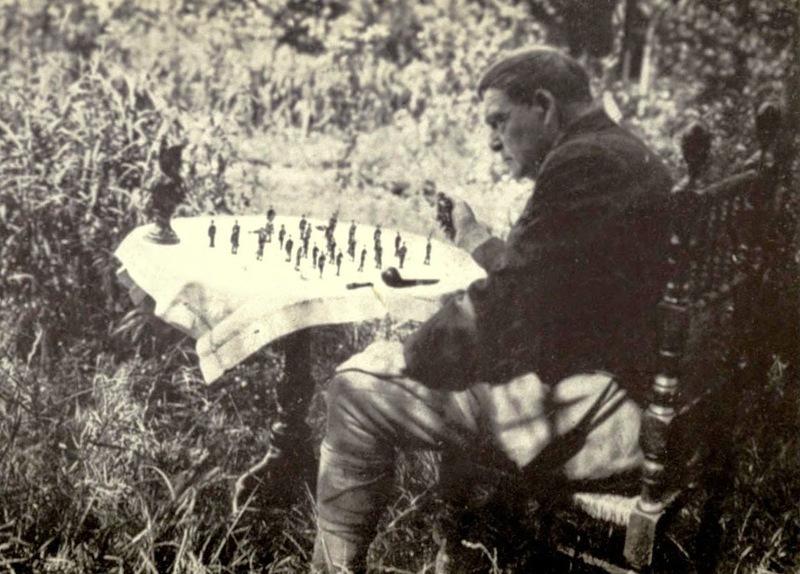 Heritage took it to his commander, Cyril St Clair Cameron (1857-1941). De la Rey also offered captain Cameron safe conduct to the spot where Lambie was buried. 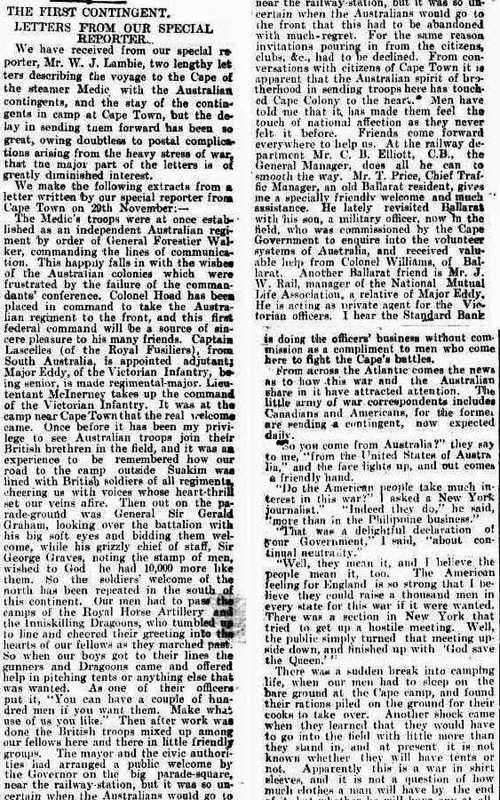 When fellow Australian war correspondents John Alexander Cameron (1869-1949; brother of Mary Gilmore; Reuters, Daily Chronicle, West Australian) and Major William Thomas Reay (1858-1929; Melbourne Herald) got to the Boer lines, they were blindfolded by a young Boer and a big German. De la Rey received them with courtesy and took them to the farm owned by Hendrik Kotze, Jasfontein, were the grave was. Hales were taken by the Boers to the Volkshospitaal in Bloemfontein. 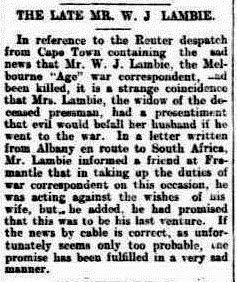 In December 1905 Lambie's body was exhumed and reburied in the military cemetery of Colesberg. Following Lambie's death, Victorian Premier Allan McLean told the State Legislative Assembly back home in Melbourne that Lambie was “an able journalist and an excellent authority on military matters”. 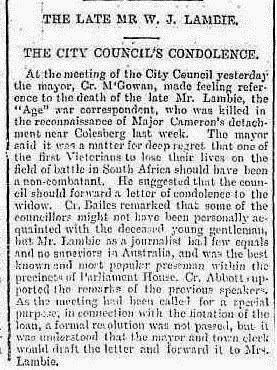 "Mr Speaker, I desire to express my deep regret at the sad intelligence conveyed to us through the papers this day with regard to the first death that has occurred in connection with troops sent from Victoria to South Africa. The gentleman who has been killed was well known to members of this House. He was an able journalist and an excellent authority on military matters, and I am sure his genial face will be very much missed in the chamber. Of course, I need hardly tell you that I refer to Mr Lambie, the War Correspondent of The Age." 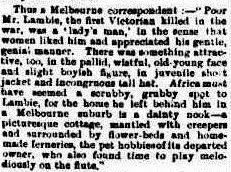 Lambie left a widow, Clara Ada Church Lambie (1862-1946), who he had married at Waratah, Victoria, on January 15, 1892. In April she was granted administration of his estate of £1339. These were published just before he died.